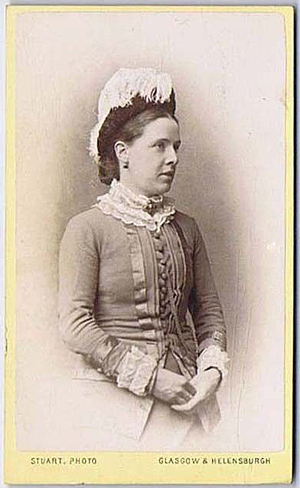 A HELENSBURGH Provost was one of the pioneers of commercial photography for half of the 19th century. And to this day his stylish pictures of people of the past sell well to collectors on Ebay. Born in Glasgow in 1831, John Stuart, son of a master joiner, served his apprenticeship in the carpentry trade. In 1851, when photography was little known about in Scotland, he became passionate about learning its mysteries and skills. While attending natural philosophy classes in the city’s Andersonian Institute he acquired a rudimentary knowledge of photography, which was developed during his attendance at chemistry classes. Having gained considerable information on the scientific side of the subject, he put it into practice, made a camera and other apparatus, and set to work as an amateur photographic artist. His first pictures of roofs and spires in his native city gave him fresh inspiration, and he pursued his studies with an enthusiasm which speedily resulted in success. He retired gradually from his ordinary occupation, devoted himself exclusively to photography, and set up in business as a ‘photographic artist’ in 1853 at 88 Glassford Street, Glasgow. Six years later he moved to 120 Buchanan Street, where he operated from 1859 to 1901, and the studio came to be recognised as one of the foremost in Scotland. The business carried on there for some years after his retiral. In 1858 Mr Stuart moved home to Byron Cottage, 170 West Princes Street, Helensburgh, and set up a studio in Lomond Street. After a few years he combined his home and business at Thistlebank, 22 Charlotte Street. From the start and for many years the burgh business was managed by William Stewart, of Giffnock Cottage, 12 Adelaide Street. Honours flowed in, and Mr Stuart was elected a member of many photographic societies. He successfully exhibited his pictures in some of the leading exhibitions at home and abroad. His professional commissions — normally portraits — also included photographing the locomotives made by Neilson & Company and the North British Locomotive Company. Dated from 1865-93, these works are noted for their crisp light, intricate details, and precise printing, and are said to be among the best of their kind. Always interested in new commercial opportunities, he published a monthly pocket railway timetable as an advertising medium — a venture which he continued for 36 years. An early edition stated: “Mr STUART desires to draw attention to a new style of permanent photograph on CHINA, or PORCELAIN, very suitable for enlargements, and which can be had either coloured or plain. He was a Fellow of the Royal Photographic Society and a staunch supporter of the Photographic Convention from its inception — and he was president at the Glasgow meeting in 1898. 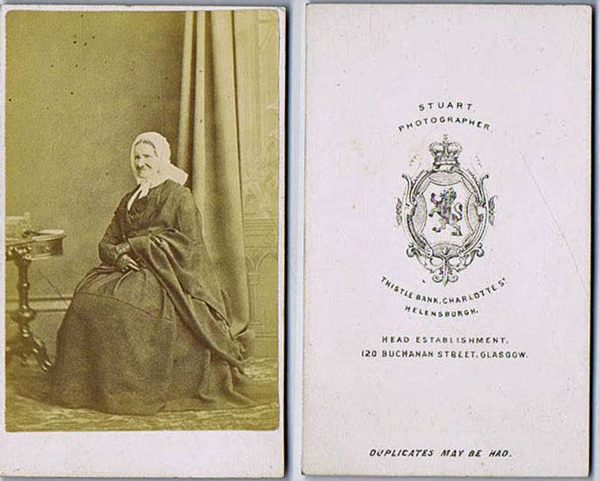 Many of his photos were cdv, an acronym for the French ‘carte de visite’, or visiting card, a style which predominated from around 1860 (more information about cdvs can be seen at the end of this article). Throughout his life Mr Stuart took a keen interest in public affairs, and proved himself a useful if controversial citizen of Helensburgh. He was first returned to the Town Council in 1865, and was a member for seventeen years. 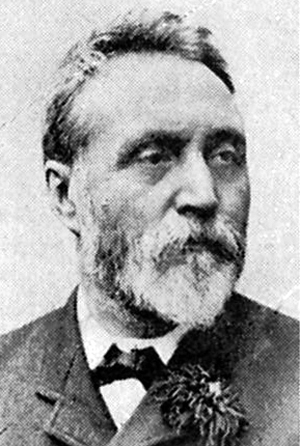 In 1869 he was created Junior Bailie, and in 1870 stepped up to Senior Bailie, reaching the top of the municipal tree in 1877 when he was chosen Provost. He held that office for seven years, and during his term was instrumental in producing many important public improvements. The first came in 1878 with the building of the Municipal Buildings in the Scotch Baronial style of architecture, from designs by John Honeyman of Glasgow, at a cost of £4,000. Later it was almost doubled in size through an extension designed by leading local architect and artist Alexander Nisbet Paterson. An improved system of drainage on the foreshore was introduced by Provost Stuart, and a portion of the East Bay was reclaimed from the encroaching sea and laid out as an esplanade. He also persuaded the council to widen West Clyde Street from William Street. A bold, though unsuccessful, attempt was made to persuade the Town Council to acquire the Gas Works, but this scheme, as well as a proposal to erect a Town Hall adjacent to the Municipal Buildings, suffered defeat. 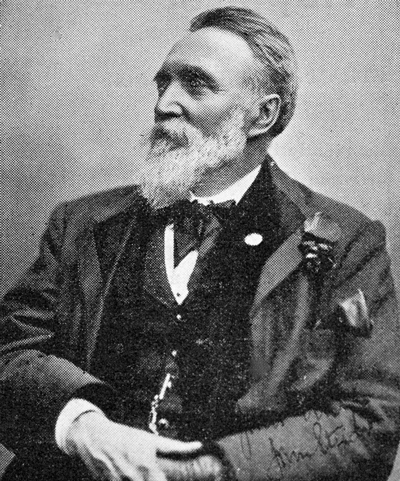 If he did not succeed in doing all he could have wished for Helensburgh, because some of his projects were nipped in the bud by adverse criticism and opposition at public meetings, he had the satisfaction of knowing that the period during which he held the reigns of local government was fruitful. Mr Stuart retired from municipal life in 1884, but from then gave candid and salutary advice to his successors. Throughout this period he was in the forefront of discussions lasting two decades over providing public hospital care in the burgh. Temporary provision for patients with infectious diseases was made by leasing a disused malt barn in Maitland Street and setting it up, but the accommodation was limited and the building unsuitable. A benevolent lady, Miss Anne Alexander, bequeathed the residue of her estate to the local authority, and the Infectious Diseases Hospital at the east end of East King Street was completed in 1875. As mixing infectious diseases patients with others was not felt to be good practice, the council eventually decided to build the adjacent Victoria Infimary in 1895, also using funds from Miss Alexander’s bequest. Mr Stuart bought a lot of property in the town, but some of his purchases did not prove very remunerative investments. Always a Liberal, for some years he was president of the Helensburgh and Gareloch Liberal Association. He was also a Commissioner of Supply and a Justice of the Peace for the county of Dumbarton. He associated himself with Park United Free Church when it was formed, and remained a loyal and devoted member. He was a deacon for many years, and later a hard-working elder. He devoted a good deal of his spare time to growing flowers, and was a successful competitor at many shows. He was also fond of dogs and poultry. John Stuart died after suffering a stroke at Thistlebank on July 14 1907 at the age of 76, six years after his wife, Margaret Renwick, whom he had married when they were both very young. After the death of his wife he did not show the same interest in life. Mrs Stuart was a cheerful and happy woman, and the loss of her companionship left an irreparable gap. An obituary in the Helensburgh and Gareloch Times stated: “In manner Mr Stuart was somewhat brusque and outspoken, and did not always appear to advantage, but behind this all there was a kind heart and a generous disposition. He was survived by his son, Major John Stuart, and his daughter, Mrs Campbell. The funeral took place to Helensburgh Cemetery. 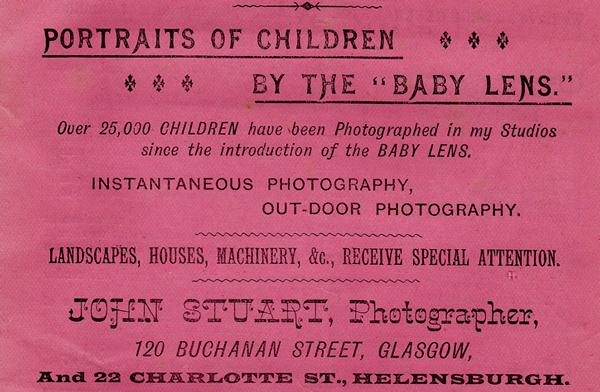 Another early local photographic business was John Douglas & Son, Photographers, Seafield Place, West Bay, Helensburgh, who also had Glasgow premises at 145 Sauchiehall Street and 108 Renfield Street. The 'Son' was John's eldest son Walter (1835-1868). Census records show that John Douglas, born in 1813 in Dollar and married to Mary Lorimer, was a portrait painter, photographer and likely snuff box painter in Helensburgh, Glasgow and Ayrshire. Another local producer of cdvs was photographer William Young, of William Street. From about 1900 the burgh had a prominent and extensively advertised photographic business, W.D.Brown & Co., of West Bay Studio, 109 West Clyde Street. It was run in the late 1930s by J.E.Polmont. Polmont was not the original family name. There is a long account in the Lennox Herald of December 12 1914 relating to the trial of William Pohlmann, described as a photographer, of 110 West Clyde Street, Helensburgh. The charge against Pohlmann was that he had failed to register under the Aliens Restrictions Order 1914. He claimed he had been employed as a photographer in Helensburgh over the previous 14 years, and a Helensburgh directory entry for 1904 lists a William Pohlmann, photographer, at West Clyde Street. He was found guilty on a technicality, and was fined £2. He decided that a change of name was a sensible move, and early post-World War One directories reveal that a William Polmont, photographer, was working from the same address as the pre-war Pohlmann. Later, the business was being run in the name of J.E.Polmont, probably a son, and he was still there in 1947. He was also running W.D.Brown & Co.
n The cdv photograph belongs to the group known as card photographs because the albumen print — a mixture of egg whites, sodium chloride, and silver nitrate — was mounted on paper cards. The size of a cdv was generally two and a quarter inches wide by four and a quarter inches tall. The photographer might print, stamp, or emboss his name and town on the back of the card or below the image, although some did not do this. Special cdv photograph albums of either leather or celluloid were sold to hold a family's collection, and these albums were often featured as props in many cdv photos. Because the subject needed to remain very still for the exposure time, the sitter often supported their head on a stand, rather like an iron floor lamp stem with a U or T shaped holder at the top. Sometimes the hint of a head-stand base can be seen behind the subject's feet, or the frame behind the head, or attached to a posing chair. The earliest cdv images were very simple photos of heads or busts of sitters that became larger in size as time went on, eventually becoming full-length portraits. As time went on in the Victorian era, props were used more, ranging from a simple column or plinth, to the subject seated at a table with a book or album. In the 1880s, props often included more furniture and artificial trees, studio fences, painted murals depicting outdoor scenes or decorated rooms, piles of hay or flowers, and many other folksy creations.